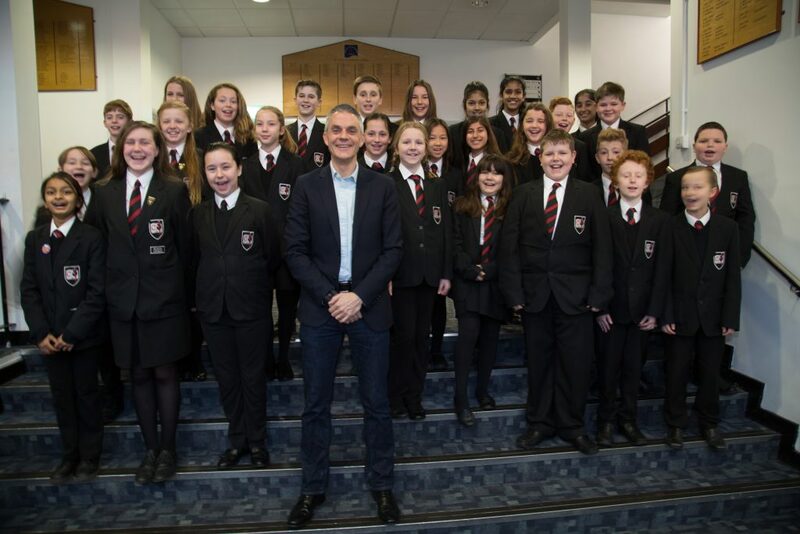 STUDENTS at Winston Churchill School heard a passionate and inspiring talk from the Chief Executive of BBC Worldwide. Tim Davie spoke about his current role in developing the corporation’s international brand and editorial strategy. He talked briefly about his role as acting Director General of the BBC in 2012 and focused on the time he was director of BBC Audio & Music, where he had overall responsibility for Radios 1, 2, 3, and 4, as well as for the BBC digital stations 6 Music, 1Extra and Radio 4 Extra. Tim Davie, CEO BBC Worldwide with WCSC Students. Tim visited the school in St John’s on Friday last week to give his talk to 240 Year 8 and Year 9 pupils as part of the Speakers4Schools Project, an independent education charity that provides access for young people in UK state schools to talks from leading influential figures in British society. At the end of his talk, Tim opened up the session to the students and was inundated with questions from an appreciative and enthusiastic audience. Following a meeting with the headteacher, Zoe Johnson Walker, Tim gave a 30-minute interview to Radio Woking from its studios in the school premises. He answered a wide range of questions from presenters Caitlin Harvey and Cleo Coffey for a programme that will be broadcast from the digital station in the next few days, and can be listened to now on the school website at https ://student.wcsc.org.uk.